The first batch of leeks and carrots are in! 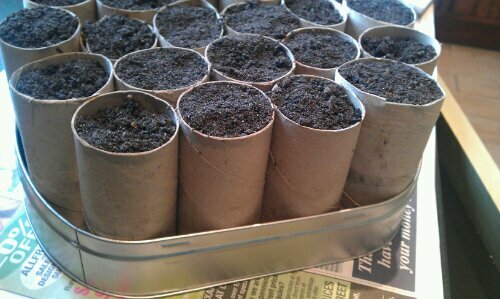 Just to prove that the toilet roll tubes worked well, here are a couple of pictures showing last weekends seed sowing. I have to confess that carrots weren’t originally on my list to grow but then I read somewhere about planting quick-growing crops in with the slower growing ones. As a result I have batches of leeks (Apollo F1) and carrots (Nantes Early?) planted and already on the garage windowsill. The toilet roll tubes look like they are working well so far too which is nice! 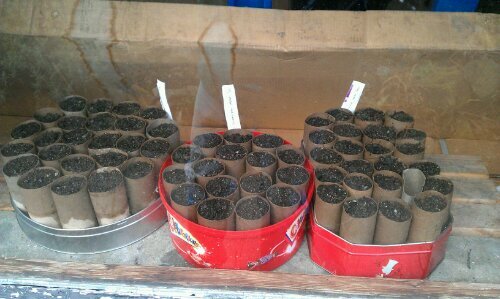 In total I have about 80 toilet roll tubes which I filled using a 20 litre bag of John Innes No 1 and that is about evenly split with 40 of leeks and 40 of carrots.